"When I was a kid, one of my heroes was Carl Lewis. At that time he was the fastest man on earth. He held the world record in the 100m and won several Olympic gold medals in the 100m, the long jump, and in the 4x100m relay. Like a lot of kids, I dreamed of being an Olympian. Standing on the world's largest stage with the greatest athletes on earth, choking back tears as the national anthem played while someone draped a gold medal around my neck. Like a lot of kids it became apparent that I was never going to be an Olympian. Hard work will carry you a long ways, but genetics start to play a factor at some point, and my genetics were never going to qualify me for the Olympics, let alone win a gold medal in the 100m. Like a lot of kids, I accepted this and moved on. I remain a huge fan of the Olympics, and my next thought was how awesome it would be to carry an Olympic torch. Again on the world's largest stage, carrying fire from Greece, to light the way for competitors who were going to test their mettle against the best the world could offer. To me, it would be the next best thing to being an Olympian myself. Today, I lived that dream, but not in the way I originally would have thought. 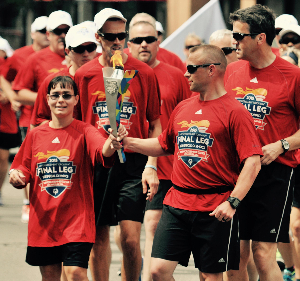 I carried the torch with a Special Olympics Olympian from Pennsylvania named Daniella. She's an amazing young lady whose smile is infectious. We carried the torch together into Santa Rosa, California. I stood on the stage with her and we both gave a speech. I talked predominately about the Law Enforcement Torch Run, and Daniella talked about how Special Olympics changed her life. I've done several things in my career I've been proud of, but today blew all of them out of the park. I was able to live my dream. And it was even better than I could have possibly imagined. It's midnight here, and we started at 0900 today. Tomorrow, we're loading the bus at 0645. I should be tired, but how can I sleep when I was part of something so HUGE today?"